It was about three months ago. It was post-holidays and my kids were starting to wake up at weird hours. My then almost 2-year-old had been sleeping through the night for a couple months but had started to wake 2 – 3 times a night again. My 7-year-old was claiming she couldn’t fall asleep until after midnight (and was awake that late when I went to her room one night). Then my 3-year-old started wandering around at 4 AM and claiming he couldn’t sleep anymore. I knew I needed to do something, so we could all have a peaceful night’s sleep again. I’ve been supplementing with magnesium lotion personally for a few years now. I’ve never been consistent with the kids, though. If they complained of growing pains, then I would put it on them, or if they were sick, but generally I didn’t. Magnesium promotes restful sleep, so I decided to try it out. Within 2 nights, all were sleeping through the night peacefully again. Awesome! We’ve been keeping up with it since (most of the time) and they have continued to sleep peacefully. Also, they get sick less often and when they do they’re over it much faster. It took weeks last fall for my 2-year-old to get over a cough after having a cold. Recently it only took a couple days. Yeah! The only problem left was that the kids were getting riled up at bedtime, and having trouble settling down to fall asleep initially. I decided it was time for some special “Good Night” lotion to solve that problem. The goal was to help the kids feel peaceful so they could fall asleep faster and easier, in addition to getting a good night’s sleep once they were out. The magnesium would promote the solid night of sleep. I chose lavender for the “fall asleep faster and easier” part. Lavender is known to promote rest and relaxation. It’s also very safe for children and babies. Plus, many like the scent. 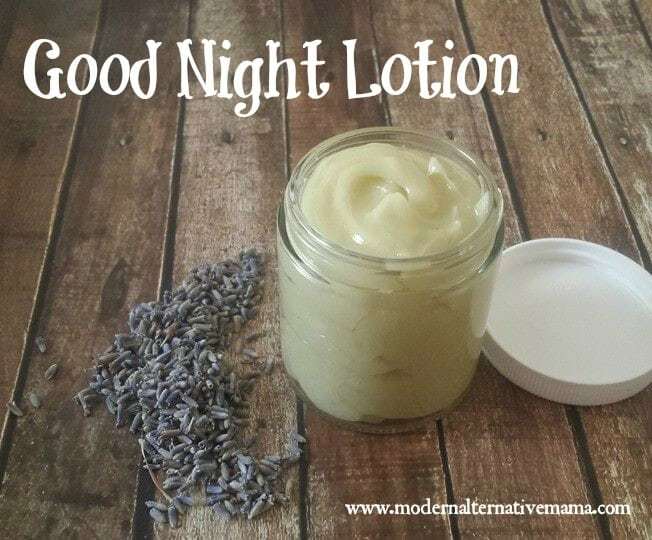 Lavender and magnesium combine to make a powerful good night lotion for, well…a good night, for all! I included only plant-based oils that are edible, so this lotion is so safe, kids could eat it! Although I wouldn’t recommend that. 🙂 This is much safer than the so-called good night lotions that come in stores (which made my poor daughter’s skin turn bright red almost instantly as a baby — one of the reasons we began to explore more natural options in the first place). It comes together very quickly and easily, too. Step 1: Melt the shea butter, coconut oil, and beeswax in a saucepan over low heat. Step 2: Add the avocado oil and magnesium oil. Step 3: Add the essential oil. Step 4: Use an immersion blender to blend it all together until thick and opaque (or pour it into a standard blender and mix it up). Step 5: Scoop/scrape it into a 4-oz. jar or tin. That’s it! Allow it to cool completely before using. Spread a small amount on thin-skinned areas, like the back of legs or bellies before bed. Promotes restful sleep all night long! Our first night using it, the kids fell asleep faster and all slept for nearly 11 hours before waking. Not bad! Good night lotion works! Love this idea, but know you aren’t ready to make it yourself? Buy it from us, right here! How do you promote restful sleep for your family? Have you ever tried a good night lotion? I’ve been using your regular magnesium lotion on my little girl, who is almost 3, and it works so well to settle her for bed. Thank you, Kate! I’ll have to try this one when it’s time to make lotion again. I’ve made your regular magnesium lotion a couple of times and our granddaughter loves it for her growing pains in her legs, but now I can’t wait to try this one for all the grandchildren. You’re doing a great job. God has certainly given you a great gift. Thank you. I know it was mentioned that you could use the lavender on a baby, but what about the magnesium? How long do you have to mix it for? I’ve been mixing it for a while and it’s still quite liquidy. I had a batch of lotion get brown and rusty looking after putting it in a metal tin. It was fine for about a week, but then you could see the discoloration start. Has this ever happened to anyone else and do you know what is happening there? Most likely, the magnesium (which is a salt solution) is reacting with the metal. I usually put mine in glass and have had no issues. It is probably from the metal tin. Use glass or plastic container instead! how old does my baby need to be before using magnesium? Well, This is certainly a gift tonight! I have a similar situation where I have been using mag for some time now, but my kiddos don’t. Bless you and your gift of sharing. My 10 year old lacrosse player with ADHD has THE worst time going to sleep. He is due to go to sleep away camp next month but is highly anxious because he can’t fall asleep and if he does he always wakes through out the night. I am making this tomorrow! I am going to add cedarwood EO to my mixure as I understand it also has wonderful properties to aid in sleep. Thank you xmillion times over! Can you use magnesium citrate powder for this? I don’t have a blender at the moment. Will it stay mixed together without the blending process? Probably not. Do you have a mixer, or immersion blender, or anything that can mix it somehow? Those should work just fine. Hi Kate, I’d really like to make this. Would you use it on a baby? If not, what age would you recommend starting to use it? Thank you! Yes, I would. I have used it on babies from 4 – 6 months. Just a very small amount, like 1/8 tsp. or less. Can the Good Night lotion be made using something besides coconut oil. We are allergic to coconut. Yes, you can use any other liquid oil. The lotion may be a bit softer, but it will work fine. Any need for vitamin E or some preservative to prevent bacteria growth? This should last up to 6 months. I make 8 oz batches and my Hubby and I use our batch up within 3-4 weeks. If you are concerned about bacteria growth in the lotion, don’t use your fingers but instead a small spatula or plastic spoon to scoop some out. I do not recommend metal spoons or jars as the minerals in the magnesium will affect the metal. On the Magnesium would I be able to use “Earth Shifts Ionic Magnesium with Trace Minerals”? I don’t see why not. Whatever form of magnesium you prefer should be fine. I am wondering if you know how many mg of magnesium is in this lotion? Like per teaspoon? It is roughly 200 mg per teaspoon. Just made a big batch of this with some friends. Smells amazing and it’s nice and smooth. Very excited to use it on my toddler! Is this safe to use on a 4 month old infant? Yes, but it may not help with better sleep just yet! I have a homemade naked salve I will add lavender and magnesium oil to, although I would recommend the feet, as these absorb things so well. When my kids started in their own beds, they were told they had to stay there, unless in need of a toilet. Also, they could not get out in the morning till they had knocked on the wall, or quietly popped into our room to ask – that came in handy when they started waking at 4 or 5 as we just sent them back to bed! At now 10 and 12, they have been (mostly) really good at that since going into a bed. Thanks for the lotion though, as my 12 year old has the lack of sleep at night gene of a teen already! Sure, you could add that or use instead of lavender. Hi there- I found you via Pinterest and was wondering does this formula work for adults? Or would you need to increase the magnesium? I’ve just ordered all the goodies to make this and have fingers crossed that this will help with my chronic insomnia. It does work for adults! Our whole family uses it every night. You just might need to use a little more lotion than a child would. Is a preservative needed for this goodnight lotion? I see a tiny bit of water used in the magnesium mix. Nope, no preservative needed! The magnesium itself acts as a natural preservative. It says magnesium oil…is that on top of the water mixture or i use the water mixure instead of the oil? Magnesium oil is the mixture of the magnesium flakes + water. would it be okay to use a small bit at naptime or would it be too strong and truly meant for nighttime stretches? I made some and it now has white chunks in it, seemed to happen lole 4 days after making it. Did it crystallize? anyone know why? This is typically from the coconut oil. It has a lower melting point than other oils, so if it gets a little warm, the coconut oil will “melt out” then re-solidify into tiny chunks. It will melt fine on your skin and not change how the lotion works. Thank you so much for this recipe I have been searching for something like this for my active 11 month old to help her calm at night. And also something for hubby and I:). I do have a question, my first batch did not get thick in the blender. It did get opaque but not thick until cooled. Also once it cooled water separated from the lotion. Are these normal? I followed the recipe but it seems off. Smells great though!! Hi Michelle! Typically that means that it was too hot when blended. It will separate if it isn’t blended at a cooler temperature. You could try to re-melt, cool the oils a bit, and then blend. Or if you make another batch just be sure to let it cool a bit more before blending. Hope that helps! Would lavender infused oil work in place of the EO? Any substitutes for the African Shea butter?